Here are three tips to help you maximize your Social Security benefit amount. It seems like a simple equation. You pay money into Social Security during your working years. You get it back when you retire. And if you hold off past full retirement age, you get more. Unfortunately, it’s not that simple. The reality is there are 2,728 core rules to the Social Security program. * Given that jaw-dropping number, it’s not surprising that many retirees are leaving substantial amounts of money on the table. The result? Valuable benefits, such as those for spouses and survivors, can be underutilized. 1. Be patient. There may be instances where you need to dip into Social Security early — if you lose your job or your health takes a turn for the worse. 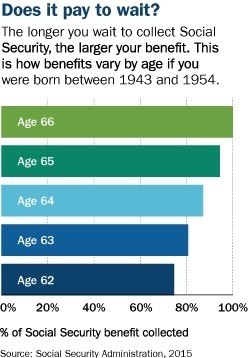 But in the long run, most people are better off waiting until full retirement age to start receiving benefits. For example, if you start collecting your Social Security benefits at age 70 rather than at age 62, your benefits would be 76% higher. Spousal benefits would be 43% higher at full retirement age of 66 than at age 62. And survivor benefits would be 40% higher at full retirement age than if you start collecting at age 60. View more information on benefit reduction amounts based on retirement age on the Social Security website. 2. Get all of what’s yours. Take all the benefits available to you based on the work history of your current spouse, your ex-spouse(s), your deceased spouse(s) and/or your deceased ex-spouse(s). Retirement benefits are based on your own earnings record. Spousal and survivor benefits are based on your spouse’s earnings, whether the spouse is deceased or divorced from you. Your financial advisor can walk you through your distribution options, point out benefits you might be missing out on and help you incorporate Social Security into your overall financial picture. “With the right guidance, it really doesn’t have to be an overwhelming process — and everyone deserves to get all they’re entitled to receive,” Kron says. Read More About Retirement Planning From Ameriprise. This information is being provided only as a general source of information and is not intended to be used as a primary basis for investment decisions, nor should it be construed as advice designed to meet the particular needs of an individual investor. Rob Kron is not affiliated with Ameriprise Financial. Please refer to the Ameriprise Financial Internet Privacy Statement for our internet privacy policies.